The mission of Jon Wayne Academy is to convey the necessary knowledge in all ways possible to it's students in order to prepare them to enter the HVAC industry with the skills, knowledge and confidence that promotes success. Jon Wayne Academy was originally started to better train the installers and service technicians within Jon Wayne Heating and Air Conditioning. The goal was to bring in a top notch HVAC instructor and make sure staff at all levels within the company were fully trained and providing Jon Wayne customers with the best possible service. In January 2008, Don Rackler, owner of Jon Wayne Heating and Air Conditioning, decided to expand the training program to include those wanting to enter the HVAC industry as well as those already working for other contractors in the area. Don's desire is to see that the San Antonio area has the best possible HVAC professionals regardless of who they work for. Today, Jon Wayne Academy provides several different training courses covering all aspects of residential heating and air conditioning systems. The Academy is located just outside of San Antonio, Texas on Highway 87 East, 5 miles east of 410 which makes it easy to get to and convenient for San Antonio residents to attend. The academy's 870 square foot classroom has enough seating for 30 students and utilizes big screen projection, power point presentations and DVD videos to enhance in-class instruction. The classroom also provides electrical and mechanical hands-on experience as well as technical material covering electrical, mechanical, air distribution and installation instruction. The Academy also has an impressive 1,370 square foot training lab unlike any other training facility in the HVAC industry. The lab offers hands on training for all levels of HVAC expertise. Major areas of learning include Air Conditioning, Gas Heating, Heat Pump, Air Side and Zoning and Manufactured Home. Real working examples for each major area are available to the student which provides for different approaches of training. The lab also allows the student to learn soldering, carpentry, duct and plenum fabrication, thermostat wiring, programming and electrical wiring. Learn more about the classroom and lab. Although Jon Wayne Academy is new to San Antonio, our instructors have decades of experience in the HVAC industry. Wesly Breazeale, our primary instructor, has been in the industry and training HVAC to students for over 26 years. His expertise includes problem solving, managing service technicians, engineering HVAC equipment and duct systems, installation and developing new techniques for training the HVAC industry. Over the years he was won numerous awards for his training excellence and service to the HVAC industry. We are extremely honored and blessed to have him lead the training program at the Academy. Learn more about Wesley Breazeale. Don is a native of San Antonio and has been involved with HVAC for almost 4 decades. He graduated from Harlandale High School in 1974 during which he won the National competition for Heating Ventilation Air Conditioning (HVAC) at the Vocation Industrial Clubs of America (VICA) event. After graduation he joined the Plumbers and Pipefitters Union Local 412 as an apprentice. During his apprenticeship, Don worked in San Antonio gaining experience and eventually became a partner at J&D Mechanical and then eventually started his own company, San Antonio Air Conditioning, in 1986. Don built a successful company as well as a solid reputation in the HVAC industry. He grew San Antonio Air Conditioning to 28 employees, and in 1999 decided to sell his company to a Air Conditioning consolidator. 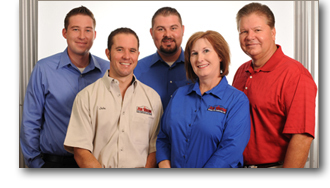 In 2002, Don started Jon Wayne Heating and Air Conditioning, LTD with his wife Pam and three sons, Brandon, Jacob and Jon Wayne. It was a new company with a bold new name, but it had the same level of expertise, strong values and commitment to service that Don had always insisted on. Throughout the years, Don recognized a slow decline in properly trained, high quality service technicians entering the industry. In 2007 Don developed the Jon Wayne Academy to train his own employees to become the best installation and service technicians in the industry. After seeing how well this worked for his company, Don felt the Academy would serve well as a training facility to introduce new and properly trained personnel into the San Antonio area HVAC industry.